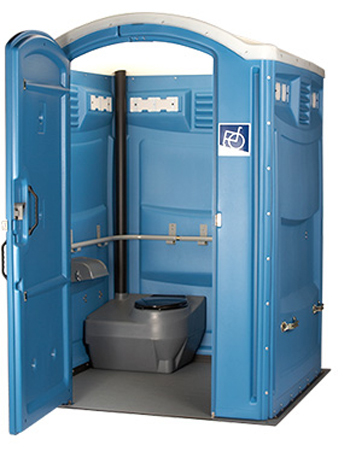 Portapottydirect.com is also specialized in renting out ADA compliant portable toilets which are very amicable in meeting the sanitary needs of physically challenged and also children who need their parents to assist while using toilets. Built as per Americans with Disabilities Act norms, these ADA Compliant Portable Toilets are very convenient for handicapped and children while attending any outdoor event. Larger, higher and wider in dimensions and tagged with a handlebar all through the interior, it’s easy for wheel chaired people to access the toilets. Dimensions of this ADA Complaint Portable Toilet are 7'-8' wide x 7'-8' long x 7'-8' high. Unlike the routine portable restrooms, this ADA compliant portable toilet has waterless hand sanitizer for the exclusive use of handicapped. It meets the declaration of ‘Accessible by handicapped and children’ . Larger inner space, free from the hassle of manual locking because of presence of magnetic doors and extra features in favor of handicapped and children – all together form the super new ADA Compliant Portable Toilet available with Portapottydirect.com for rent.